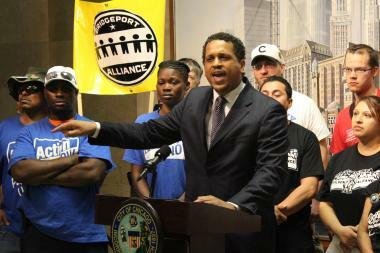 Blaine Elementary Principal Troy LaRaviere got a new four-year contract despite his criticism of CPS. LAKEVIEW — After publicly ripping the Chicago Public Schools administration he works for and actively campaigning against Mayor Rahm Emanuel, you might think Blaine Elementary principal Troy LaRaviere would be looking for a new job. The local school council at his Lakeview school loves him — and just unanimously renewed his contract late last month. LaRaviere has "absolutely" been a good leader for the school at 1420 W. Grace St., says LSC member Amy Derksen. "His outspokenness has been key to helping us navigate budget cuts," she said. "He's put together a rock-star team of teachers and staff, and the kids are thriving. He's been able to keep performance growing while advocating on the bigger issues." Now in his fourth year at Blaine, LaRaviere has raised academic standards at one of the highest-ranked elementary schools in Chicago. Nearly 90 percent of students meet state standards and the school's growth on reading tests is better than 99 percent of schools nationally. "There was a huge change in the school when Mr. LaRaviere became principal. He brought in the most recent thinking in educational research and put pressure on the teachers to perform to the highest standards," said Erica Salem, who has two seventh-grade students at Blaine. Salem said LaRaviere holds teachers accountable and provides them with constructive feedback, although she said some were unhappy with the change. "One teacher told me at the time that she had never worked harder nor ever learned so much," Salem said. LaRaviere, who lives in Beverly, has also led the charge against standardized testing known as PARCC, which continues at the school this month. Working with the school's Parent Teacher Association, his push helped lead to 80 percent of students opting out of what he calls a "massive waste of resources." The push came after he blasted Emanuel in a letter that appeared in the Sun-Times last year, saying there were political pressures not to criticize the administration and saying budget cuts were draconian. And in January, he threw his support behind mayoral challenger Jesus "Chuy" Garcia, serving as an education adviser and claiming in a campaign video that Chicago principals no longer had authority over their own schools. "This administration is the worst thing that has happened to CPS in the history of CPS, and it's driving people away," LaRaviere told DNAinfo Chicago, citing over-testing and disrespect toward school leaders as key issues. "[Emanuel] doesn't make tough decisions. He forces us to make the tough decisions," LaRaviere said. "It's like someone holding your cat and your dog over a ledge, and you can only grab one. And the person who held them over the ledge drops the other one and says, 'Well, you made that decision.' No, you made the decision inevitable, because you have the power." LaRaviere wasn't surprised by Elisabeth Heurtefeu's announcement last month she would resign as principal of LaSalle Language Academy, in part because of over-testing. "I'm never surprised by anyone resigning in CPS. We all have our breaking point. It could be testing, it could be being micromanaged or taking away funds from schools and making cuts they put on us," LaRaviere said. CPS officials declined to comment on LaRaviere's criticism, but said they were forced to administer the Common Core-based testing after the Illinois State Board of Education threatened to withhold state and federal funding from the district and place it on probation if the test was not administered to all eligible students. Still, LaRaviere has his detractors. Several parents claimed LaRaviere prioritizes his own agenda over student's needs and bullied them into opting out of testing. Melanie Aronson pulled her children from Blaine two years ago after she said the administration was "very dismissive" about getting her daughter tested for a learning disability. She also said the severe bullying of her son went ignored by educators. "My son was barfing every morning and didn't want to go to school. When I approached the administrators, they literally did nothing," Aronson said. Eventually, Aronson said LaRaviere told her he would have a "tough-love talk" with the bully, but at that point, she decided it was time to leave Blaine. One parent filed a complaint with the Illinois State Board of Education in February, claiming her special-needs son was verbally abused and inappropriately restrained by a teacher and a temporary aide. When the parent complained to LaRaviere, he told her, "I can't allow parents to demand who works with their children," she said. "Instead of approaching it with concern, they were defensive, and their approach was to deny what happened. This is the kind of Gestapo tactics they use at Blaine," the parent told DNAinfo Chicago. LaRaviere denied the parent's claims. He said he never opposed a parent's attempt to test a student for learning disabilities. "No parent can claim they came to me and I didn't follow through," he said. "That's a complete falsehood." On the state complaint, he said the school cooperated with three investigations, which found the allegations to be unfounded. Salem said her son also dealt with a bully, but the school quickly responded and took the incident "very, very seriously." She said she understands there are parents who don't agree with LaRaviere's methods, but she believes the overall results have been positive. "I believe there will never be a principal who will make all parents happy. Some parents have complained that he is not responsive to their concerns — at least not in the manner they would like," Salem said. LaRaviere denied he bullied parents in general and or pushed them to opt out of PARCC testing, saying, "I don't push one way or the other. I just state my opinion." As to LaRaviere's public stance when it comes to politics, Salem is "personally conflicted about this, but I think that someone needs to take a stand." LaRaviere has no plans to change his style: "As long as I'm working for the students, I'm going to be calling out practices that are not in our students' best interests."